“Our food is made up of five elements, so when we consume it, it nourishes the physical body with the elements. It can nourish the soul only if it is cooked with love and a peaceful attitude. Sanskara from the person cooking is transferred to the one eating that food. 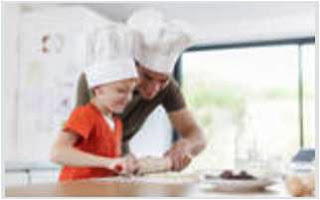 So if mothers want their children to develop sanskara from them (instead of the maid's sanskara), they need to cook for their kids “ along with a beautiful video presentation on Satvik cooking workshop. But the connection with the mother is 24/7, it is not the same with the father. Even when the umbilical cord is cut after the birth to end the physical connection with the mother, ethereal umbilical cord exists for the life time. That is why I advise mothers not to worry about their children, it can have adverse effect on them. When they trust and have faith in their kids, they can excel in whatever they do. In earlier days, when a girl was married, she got integrated into the husband’s family. She took the husband’s surname, and in many instances, even her first name was changed, to denote her new birth. It used to be the custom for the bride to touch her parents-in- law’s feet every day morning, and before sleep, she used to press and massage the feet of her mother-in-law. By doing this, she was imbibing the sanskara of her husband’s family. So when the mother cooked food for the children, it was sanskara of the family (both mother and father) that was being transferred to the child. Earlier, when alliance for a girl was seen, the sanskara of the family used to be one important criterion, to see that the girl goes to a family with superior sanskara or at least similar sanskara. In the absence of acquisition of the sanskara of the husband’s family by the wife, it is only the mother’s sanskaras that will be transferred to the child. So, how can the father make sure his sanskaras are also transferred? By giving time to the child, by having open conversations, and by actively participating in the day to day happenings in the child’s life. Here we have to remember, providing “quality time” doesn’t work. That concept is an eye wash; you can just satisfy your mind that you are participating in the child rearing, nothing more than that. Or better, the father can cook during weekends. This can give a much needed rest for a working wife, who also does the full cooking. At least one meal per week can be cooked by the father, and if he can involve his son also in the process, he is ensuring a better husband and father of tomorrow!